The key theme of the show was around the story of “Stone Soup”. There are several versions of this tale, but for this particular performance the story starts with three monks wandering into a village where they hoped to get a meal and some rest. As they walked through the village, they found a community of hard working individuals who largely kept to themselves and appeared generally bored and unhappy. As the monks went door to door looking for a place to stay, no one would even answer their knocks as the villagers chose to focus on their own concerns rather than to help some strangers. The monks had an immediate concern for shelter, but also saw an opportunity to rejuvenate the culture of this village. So they went to the middle of town, started a fire, and got the attention of a young girl from the village. They told the girl that they were preparing to make stone soup, and that all they needed was a large pot and some water. The girl rushed home, asked her mom for a pot, and together they walked back to the monks. As the monks boiled the water, a crowd started to form as one of the monks ceremoniously placed their magic stones into the water. The buzz of the event spread throughout the village, and everyone dropped what they were doing to be a part of the excitement. As the monks stirred the pot, one of them smelled the soup and said aloud that it could taste even better with a dash of salt and pepper. So one of the villagers ran home and grabbed generous amounts of the spices to add to the soup. Upon adding the spices, a second monk tasted the soup and exclaimed, “What would really be delightful are some fresh carrots!” So another of the villagers ran home and grabbed several bunches of carrots. And this process continued as all of the villagers became involved, bringing meats, vegetables, sides of bread, and desserts… all to help the monks in their fascinating brew of stone soup. Upon completion of the soup, the monks dished it out and the villagers enjoyed the most delicious soup that any of them had ever tasted. Everyone laughed, enjoyed each other’s company, and danced through the night, as the enjoyment of stone soup was not felt merely in their mouths and stomachs, but in their hearts and souls as well. 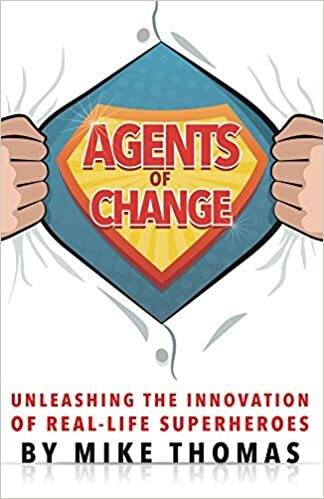 This story hit home for me beyond the songs and dance moves of my daughter’s class, as I reflected on the role of the innovator and the leader. We often are tasked to create a delicious soup and to rally our village of coworkers to provide the effort, time, and ingredients to bring this soup to life. However, many times the path taken is dramatically different than that of these monks. 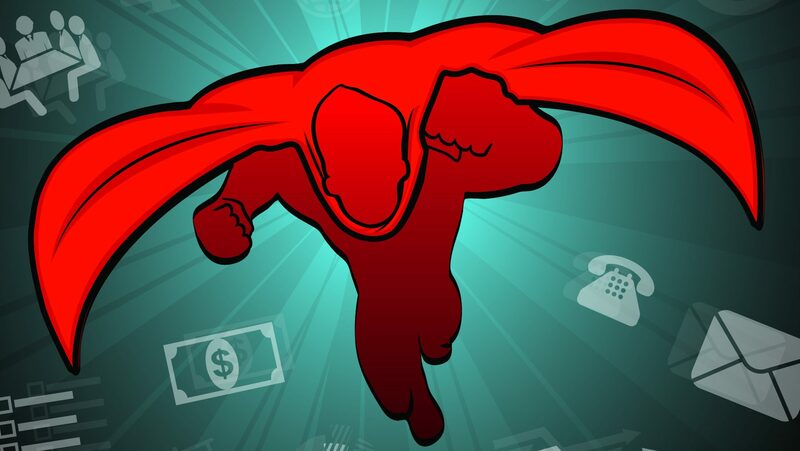 Instead of creating an inspiring and somewhat open ended vision that attracts and enrolls followers, do we serve up a prescriptive recipe and demand strict adherence? Do we encourage a spirit of shared creativity or of strict compliance? Are we open to the amazing possibilities that the acceptance of new ideas can incite, or are we afraid of the potential chaos and uncertainty? As leaders, we want to insure that our team can successfully execute a winning recipe and to deliver the desired results on time. As innovators, we want the freedom to imagine possibilities, to experiment, and to work in a culture where all voices can be heard and new ideas can be incorporated. We all want delicious soup. To create an environment where our innovators bring their passion, their extra effort, and their best ingredients for our soup, we need to enroll them into the process of creation higher than just the process of execution. Had the monks gone into town, told the villagers that they were making the best soup in the world, and ordered them to bring back all of the necessary ingredients, participation would have been reluctant and reticent… if it had occurred at all. As leaders, it still is important to have a bold vision to inspire and to guide the organization, but to leave that vision open enough for growth and builds from the innovative minds and spirits of the team. The beauty of “stone soup” is that it is an interesting and magical concept that inspired a community to not only be a part of it… but to invest their best time and resources to make it better. 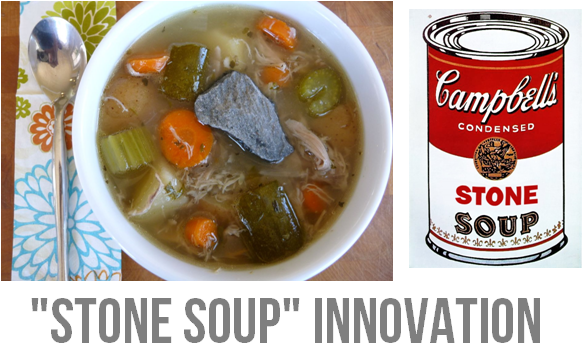 “Stone soup innovation” can thus not only yield the best possible soup, but an improved innovation culture as well. The monks will attract, rather than obligate followers, the villagers will come out of their shells and openly share the best of themselves, and everyone can dance and celebrate long into the night.